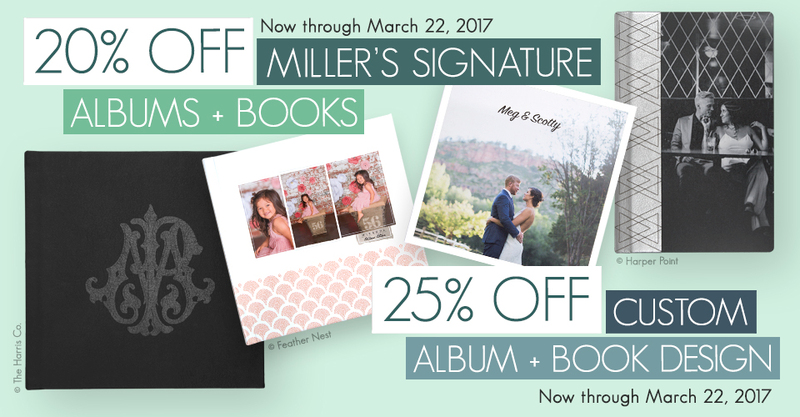 You can save 20% on Miller’s Signature Albums and Miller’s Signature Books through March 22nd. Bring the joy of printed photographs into your clients’ homes with a premium book or album in as little as 2-3 days. Not enough time to design your album? Commission our skilled team of artists to design your album with a 25% discount. Find out how our Art Department can serve your needs. Please Note: This sale is valid for Miller’s Signature Albums, Miller’s Signature Books and Custom Album Designs only. Add-ons (Foil Stamping, Gilding) and surface modifications (lustre coating, texture) will not be discounted. Sample albums do not receive an additional discount (samples are discounted by 25%). This offer is available through ROES and Designer Plus but is not available on orders submitted through Fundy Direct. The sale price will not be reflected in order summaries or email confirmations. The discount will appear once the order has been received by the lab. Offer expires at 11:59 p.m. (Central) on March 22nd. I sell an album plus digital files with almost every session….to me, these are the most amazing value and quality of any out there. Thank you for keeping the products you offer so consistently fabulous!